Rimmel London Match Perfection Foundation & Revlon Colorstay Foundation (Oily/Combination Skin). 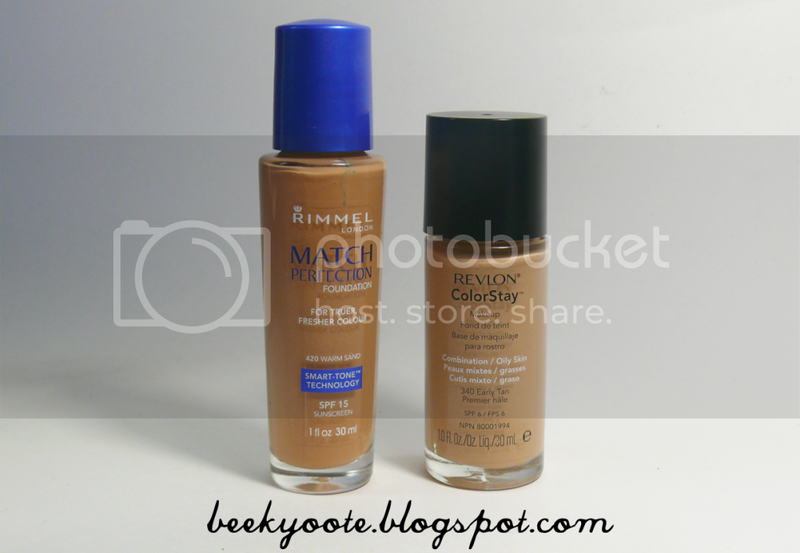 Rimmel London Match Perfection Foundation. Rimmel Match Perfection Foundation in 420 Warm Sand. Unique innovative formula with Smart-Tone technology to mimic your skin tone and texture. Blue sapphire gives truer, fresher colour for a flawless natural finish. SPF 15 sunscreen. Available in 16 different shades for all skin tones! What I like: This foundation has SPF 15 & medium coverage which can be built up to full coverage. I luckily picked the shade that suits my skin color well! It doesn't dry quickly, giving you time to blend it out before it sets itself as it is. It doesn't cake up and has a dewy finish. No need for a powder foundation on top! Just a translucent setting powder would finish it off. I didn't break out from this and I think the staying powder is quite good. And finally, it doesn't accentuate my pores. And oh, the packaging is in a level better than the usual squeeze tube but it still needs a pump for better control. What I don't like: Unfortunately, the claim to "mimic your skin tone and texture" is totally off. The foundation is quite thick and gives the feel of wearing makeup (I used to hate makeup because the way foundation feels on my face). It also doesn't dry up in a sense that it looks dewy because it is wet/tacky even after you blend it in. Using a translucent setting powder may help this out. I don't recommend anyone to use a powder foundation on top of it because the makeup will feel heavier than it already is and will definitely give you that heavy look. This is not for people with oily skin, the dewy effect may look greasy later on and you will need to blot off the oil. Personally, I think this is fine for my oily skin here in the US but I'm not quite sure it will do well if I use this in the Philippines (high humidity). My sisters commented that the foundation looks like it was slapped on my face... It doesn't blend so well and may literally look like its just sitting on your face if used without proper blending. I noticed I still could see some of my bumps, a few fine lines, and the darkest post-acne marks on my face. 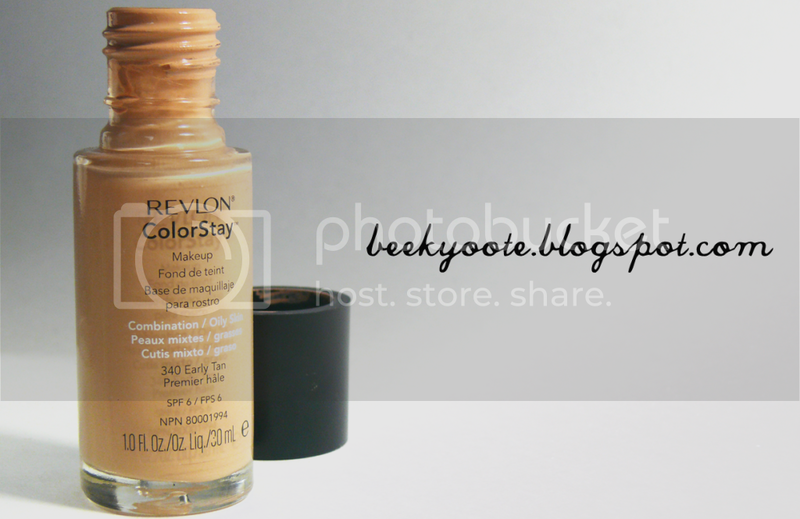 Revlon Colorstay Foundation (Oily/Combination Skin). Revlon Colorstay Foundation (Oily/Combination Skin) in 340 Early Tan. Provides lightweight comfort, so you feel like you’re not wearing makeup. Looks fresh for up to 16 hours. Specially formulated for combination or oily skin, this oil-free formula helps control shine all day and gives you flawless looking skin. Makeup looks fresh and feels great for up to 16 hours thanks to the lightweight, comfortable feel from the SoftFlex ColorStay™ formula. Medium to full coverage, with SPF 6 protection*. What I like: The coverage is medium to full. It has SPF 6. It feels light on the face and finishes matte. It does lasts a whole day I am in school (about 9 hours). And great for extremely oily skin and for those who live in humid places. What I don't like: It is drying and cakes up on my face! You have to apply it quickly at one area at a time because it dries up really fast. And the consistency is so much like water that if you put it at the back of your hand, prior to application to your face, it will drip down. And the packaging is really bad since it has no pump to dispense the product which then makes it hard to control how much you're going to take out. I noticed that it seems to sink in my pores, making them a little visible, and showed most of my bumps along with a lot of fine lines. My sister said this was even worse than the Rimmel Match Perfection Foundation because it made me look more fake, like a clown and plain terrible when applied as is. But when I did use it out, I had to spray on facial mists & buff it out so many times to get the texture nice but that never really solved the problem completely. I also bought this in the wrong shade and so I had to use my MAC Mineral Skinfinish Natural to make this match the rest of my body. Finally, it's also quite pricey for a drugstore foundation. Basically, I am disappointed. It would probably work in the Philippines but not here! I was really looking forward to this foundation because so many people raved about it and I heard it was sort of a dupe for the MAC Studiofix Fluid (which I'm dying to try now). Anyways, I won't repurchase unless I'm in the Philippines and it works for me there (in a different shade, of course!) I'll probably try the formulation for the Dry/Normal Skin and see if its any good since this foundation was just really too drying for my oily face. Swatches: Rimmel London Perfecting Foundation in 420 Warm Sand & Revlon Colorstay in 340 Early Tan. Despite the shortcoming of both the foundations, I am trying my best to love them! Yes, even if it means I need to spritz on more facial mist than the usual and keep buffing away the cakey-ness! I really don't want to waste money... Both foundations seem fine on camera (thankfully!). I usually use BB Cream on daily basis when I go out anyways! Have any of you tried this? Leave a comment to tell me your experience with these products! 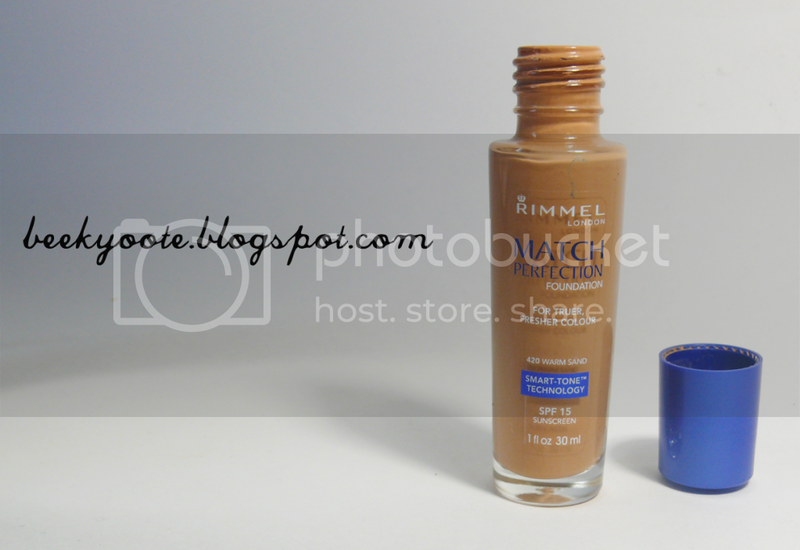 Rimmel is somewhat new in the US drugstores and beauty gurus in youtube, including Michelle Phan, raves that Rimmel is making pretty good foundations, so I tried it.